The entrepreneur must possess a substantial ownership interest in a start-up entity created within the past five years in the United States that has substantial potential for rapid growth and job creation. The entrepreneur must have a central and active role in the start-up entity such that the applicant is well-positioned to substantially assist with the growth and success of the business. The applicant can further validate, through reliable supporting evidence, the entity’s substantial potential for rapid growth and job creation. Investments from established U.S. investors: The applicant may show that the entity has received significant investment of capital from certain qualified U.S. investors with established records of successful investments. An applicant would generally be able to meet this standard by demonstrating that the start-up entity has received investments of capital totaling $250,000 or more from established U.S. investors (such as venture capital firms, angel investors, or start-up accelerators) with a history of substantial investment in successful start-up entities. Government grants: The applicant may show that the start-up entity has received significant awards or grants from Federal, State or local government entities with expertise in economic development, research and development, or job creation. An applicant would generally be able to meet this standard by demonstrating that the start-up entity has received monetary awards or grants totaling $100,000 or more from government entities that typically provide such funding to U.S. businesses for economic, research and development, or job creation purposes. Alternative criteria: The final rule provides alternative criteria under which an applicant who partially meets one or more of the above criteria related to capital investment or government funding may be considered for parole under this rule if he or she provides additional reliable and compelling evidence that they would provide a significant public benefit to the United States. Such evidence must serve as a compelling validation of the entity’s substantial potential for rapid growth and job creation. According to the final rule, a qualified investment is one that has been “made in good faith of lawfully derived capital that is a purchase from the start-up entity of equity or convertible debt” Proposed 8 CFR §212.19(a)(4). An individual or organization may be considered a qualified investor if, during the preceding 5 years: (i) The individual or organization made investments in start-up entities in exchange for equity or convertible debt comprising a total within such 5-year period of no less than $600,000; and (ii) subsequent to such investment by such individual or organization, at least 2 such entities each created at least 5 qualified jobs or generated at least $500,000 in revenue with average annualized revenue growth of at least 20 percent. Investments made by a corporation, LLC, partnership, or other entity in which the entrepreneur or his or her relatives has a direct or indirect ownership interest will not qualify. Additionally, investments made by the entrepreneur himself, his/her parent, spouse, sibling, or child will not qualify. Under the final rule, DHS has proposed a minimum investment amount of $250,000. Under the final rule, an applicant would generally be able to meet the investment standard by demonstrating that the start-up entity has received investments of capital totaling $250,000 or more from established U.S. investors (such as venture capital firms, angel investors, or start-up accelerators) with a history of substantial investment in successful start-up entities. The timeframe during which the qualifying investments must be received is 18 months immediately preceding the filing of an application for initial parole. 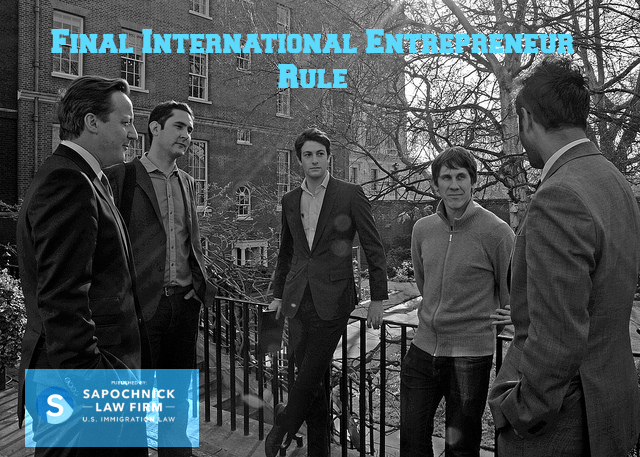 The final rule provides more guidance on what it means to be a qualifying “entrepreneur.” To demonstrate that you meet the definition of “entrepreneur” you must possess at least 10% ownership interest in the entity at the time of adjudication of the initial grant of parole, and you must have an active and central role in the operations and future growth of the startup entity such that your combined knowledge, skills, and experience will substantially assist in the growth of the business in the United States. Being a mere investor in the start-up entity will not qualify you for parole. Which start-up companies will qualify? To meet the definition of “start-up entity” the company 1) must be a qualifying United States business entity 2) must have been lawfully formed in the United States within 5 years immediately preceding the date of filing of the initial parole application 3) must have been conducting active lawful business since its founding and 4) demonstrate a substantial potential to increase jobs and business growth in the United States. Start-up entities that will not qualify for this program include small businesses that have limited potential to provide jobs and create growth in the United States, created for the sole purpose of providing income to the entrepreneur and his or her family.